George Whitman of Shakespeare & Company - Thanks for a memorable evening in May! A film crew preparing to shoot a scene at Shakespeare & Co. during my first visit to the store in March 2011. Rather than speak of Mr. Whitman's death, I would prefer to tell you about the one and only time that I had the pleasure of seeing him. It was during an unseasonably warm evening last May when an enthusiastic crowd of expats and tourists was gathered in front of the book store. While tapping their toes to the lively tunes of "The Paris Sheiks", everyone's gaze shifted momentarily from the band to the tufted head of an elderly gentleman peering out from one of the windows above the shop. As word quickly spread that it was George Whitman, Sylvia turned, caught sight of her father and waved. Spontaneously, everyone else yelled, "Hello George" and applauded. He smiled, remained at the window for a few more minutes and then disappeared from sight. When the person next to me mentioned that Mr. Whitman was in his nineties, I remember thinking that it must have been reassuring for him to have tangible evidence that his life's work has touched so many lives. Without a doubt - one of my best memories of Paris was created that night. Thanks, George! 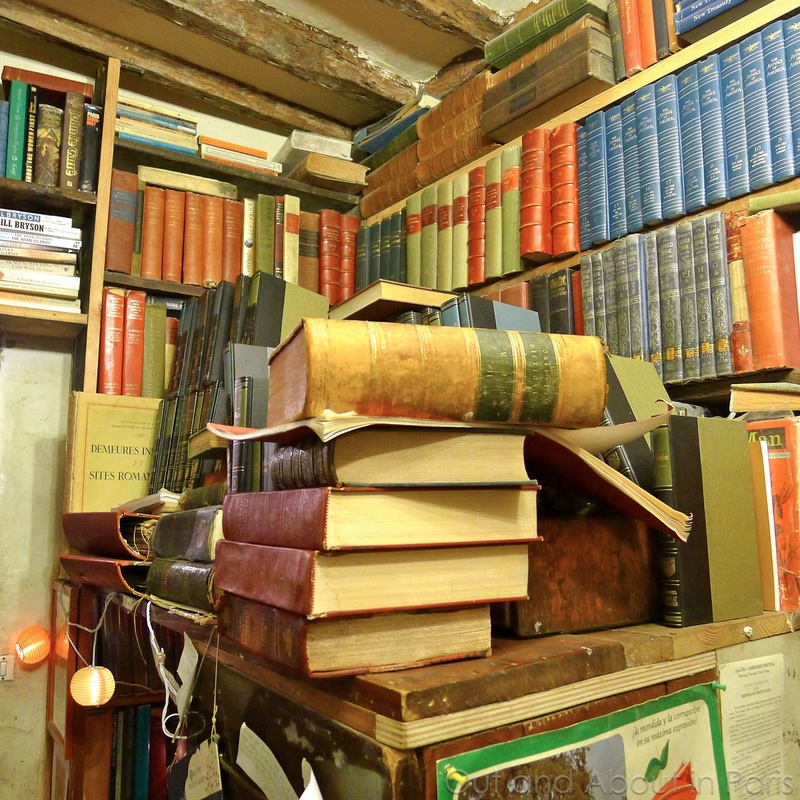 Do you have a favorite Shakespeare & Co. memory? If you would like to learn more about Mr. Whitman's life, here are the links for an article in the New York Times and for the documentary, Portrait of a Bookstore as an Old Man. Please click on any of the photos that you would like to enlarge. Sylvia Beach Whitman, in the blue dress, is Mr. Whitman's only child and runs the store. 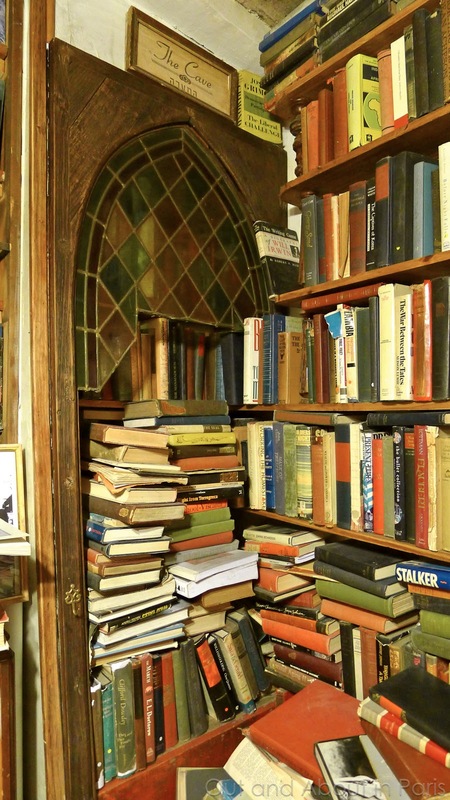 Just a few of the many notes to be found hanging in one of the nooks at Shakespeare & Co. Some express their gratitude for the store while others leave words of wisdom. "Don't tell me the sky is the limit when there are footprints on the moon." Honestly, I like it more as a concept than as a reality. 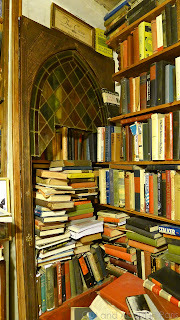 As a bookstore I found it difficult to browse and too musty, dusty, dirty. But if it didn't exist, someone would have to invent it. I feel like I bought a book there, but I can't don't remember which one it is. Maybe that will be my albatross for the next few days. Yes, I'm pretty sure I bought a book there many years ago, I recall getting the special stamp in the book. Now I will have to find it. One more point, people should buy a book from the store when they visit, or it won't be there the next time around. It's not just a tourist attraction, it's a business trying to make ends meet. If not a book, buy your postcards there. And don't expect a cup of tea. 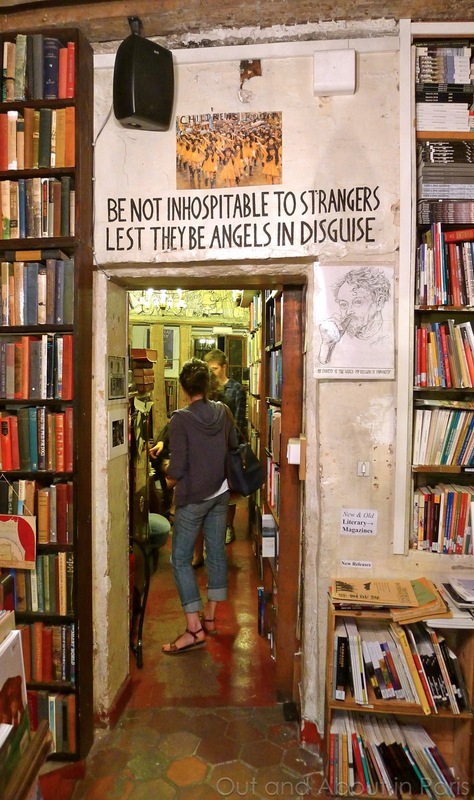 Joseph, Your comment about "if it didn't exist, someone would have to invent it" is exactly what I love about Shakespeare & Co. Whenever I'm there, I feel as if I'm visiting a place out of my imagination. I'm not sure when you were last there, but it seems as if the store has improved quite a bit since Sylvia, Mr. Whitman's daughter, started managing it. And the author events aren't to be missed, if possible. I don't know if the stamp has changed, but on my books there's a picture of Shakespeare's head with the words, "Shakespeare and Company * Kilometer Zero Paris*"
That's an excellent point about buying a book - I always pick up one or two whenever I'm there. And I always ask them to stamp them! I have very fond memories of this evening - as we went there together on my visit to Paris. Although we saw Mr Whitman only for a few moments, it was very touching. Another memory: you couldn't understand why I didn't want to get the stamp in my newly purchased book. We were almost having an argument about it (you called me a stubborn Swiss)! I'm sorry to hear of Mr Whitman's death, but I hope that the shop will be able stay open, despite or thanks to its somewhat charming quaintness. Heidi, I'm so happy that we share the memory of that evening. As I said, it was one of the best that I've had in Paris. Next time, tell your pushy American friend (that would be me) to leave you alone and not try to convince you that you need a stamp in your new book. And I'm sorry about calling you a stubborn Swiss! I think I'd run amok if I went into a shop with that many English books - I know the kids would! 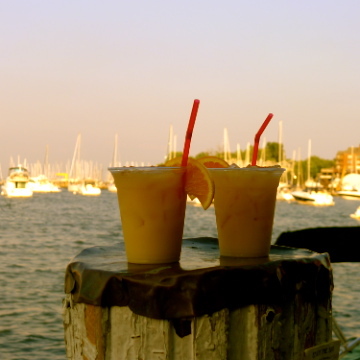 We'd easily spend the day and our life's savings there! Ebooks are definitely the future but the printed book is going to hang on in there with its appeal for a long time yet. 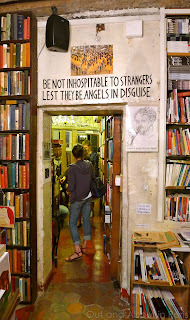 Steph, Even though I love my Kindle, it can't compare with a trip to Shakespeare & Company. It's magical to be one of the last ones in the store at night and to look out the window at Notre Dame. And it's even better when someone else is playing classical music on the old upright piano. Please plan to visit when you're in Paris but try to go at a time when there aren't so many people so that you can soak up the atmosphere. The author events are excellent. You should come and talk about your books in Paris!